Our honey varieties have creative names to honor our creative bees and the locations of our apiaries. While the bees in most of the United States are trying to survive harsh winters, our San Francisco Bay Area Bees are making Winter Honey from the blooms of the coastal Blue Gum Eucalyptus and Acacia Trees. This Honey tastes like Lavender Blossoms smell - like perfume for your palette. Our California Honey Bees spend the early Spring pollinating the Orange blossoms & gathering the special floral pollens and nectars that give pure Orange Blossom honey its light flowery taste & color. A most unique tast & light yellow color always denotes pure Star Thistle Honey. California's middle to late summer flower is found in those seemingly barren brown hills. The plant, with its sharp spikes & yellow flowers is not a friendly one - It is a rancher's nightmare & beekeeper's dream come true. The spikes, however, seem to guard the sweet nectars within. Only the honey bee can bring this unique taste to us to harvest for you. A rich dark honey harvested from the California foothills. A favorite! A healthful mild honey, harvested from the east side of the Sierras. Napa Valley Wildflower, Sonoma County Wildflower, Marin Wildflower, East Bay Wildflower & more. Our wildflower honeys are complex reflecting the nectar mix from many different seasonal wildflowers. Some are mild, some burst with flavor. Some are dark and strong like molasses. Light honeys tend to be from Spring harvests. Most of the dark strong honeys are harvested in Fall. The Magic Of Blending: Our Beekepper, Spencer Marshall, has created a special blend that captures all of the pollens & nectars of the Counties by the Bay. The blend changes with the seasons. A truly exciting honey. Great for alleargy relief too! Harvested from our beehives at the Organic Garden of the Culinary Institute of America, Greystone, St. Helena, Napa Valley, CA. Harvesting four times each year creates four distinct honeys from this locations. The honey is complex, reflecting the flowers, seasonal crops, herbs & wildflowers growing in and near the garden. The honey harvests are small. The tastes are always extraordinary! Lavender growers in California are scarce, but our Beekeeper has brought our bees to the Lavender fields of Sonoma County. Beekeeper, Bees, Lavender flowers, together, have created this exquisite taste foryou. It's incredibly unique, its taste - "Squashy" - Our bees pollinate the pumpkin blossoms. Our beekeeper harvests the honey just after the bloom is over. The taste is like no other. Harvested from our hives at Boyd's Napa Valley Organic Berry Farm... A late Spring - early Summer bloom. A very delicate taste. A prize winner ! Alameda County: Buzzerkely Beehives in Berkeley? California Honeys: You pick the Honey, we have the fun labels Happy Honeykah Honey Give one for each of the 8 nights of "HONEYkah." California Honeys: You pick the Honey, we have the fun labels It's not my Faultline Honey Try this one with a jar of "Faultline Honey." 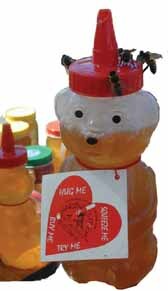 California Honeys: You pick the Honey, we have the fun labels Kiss Me Honey Pucker Up when you taste this sweet nectar. Infused Lavender Honey You can taste the flowers in this jar of honey. California Honeys: You pick the Honey, we have the fun labels Mystery Blend The label on the bucket got lost, but we can guarantee it's bee-licious. Our famous Star Thistle Honey! Voted one of the 125 best things to eat in San Francisco Magazine! Wild West Wildflower A rich dark honey blend. Great for barbecue sauces, biscuits, baking & just good eating. East Bay Wildflower Take the Bay Bridge from S.F. to Alameda & Contra Costa Counties for this wildflower honey. Manzanita Honey California Manzanita Honey - a dark honey - Mrs. Marshall's favorite. Marin: Beach Blossom Honey Bring the coastal blossoms to your table. Eucalyptus Honey EuCacialicious - The Eucalyptus & Acacia trees bloom side by side for this honey. Fairfax Flower A Village mix from Fairfax & San Anselmo. Haunted Honey The Graveyard bees made this honey. Jailbreak You'll bee sentenced to life with Marshall's Farm Honey when you taste this from San Quentin. Lucas Valley Wildflower It's out of this world when we have it. Marin Epicenter You'll Shake, You'll Quake, You'll Cook & Bake with Marin Epicenter Honey. Marin Mix From the finest zip codes in the county. Mill Valley Honey Perfect for your Latte! Power Flower This Honey will Knock out your Honey Receptors. San Rafael Wildflower Try it You'll Like it. Tiburon Honey These bees have a great view of the Golden Gate. Napa Valley Wildflower A fine vintage from California's most famous Wine Country. St. Helena Meritage A Very special blend of Napa Valley Honey. Neighborhood Honeys Honey from specific San Francisco neighborhoods. Clover Honey Roll Me Over Roll Me Over in a field of 5-Leaf Clovers - It's that good. Orange Blossom Honey From California Orange Groves. The Orangey-est, Blossomy-est-House & Garden Magazine called our Orange Blossom "The Best Take on this Variety in America." San Mateo: Faultline Honey You'll Shake, You'll Quake, You'll Cook & Bake with Faultline Honey - a fun gift with "It's not my Faultline Honey!" Pumpkin Blossom It's incredible, strong and squashy.from the natural nectars of the pumpkin flowers.